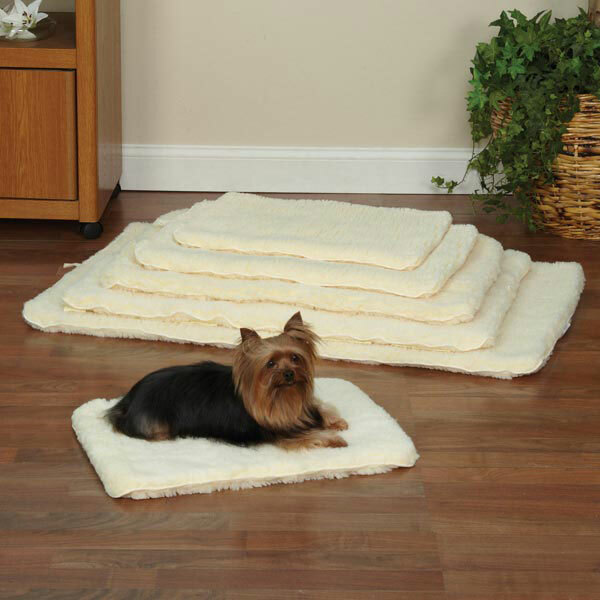 Our Slumber Pet™ Double-Sided Sherpa Mat in Natural feature heavenly sherpa with thick pile that is double-sided for exceptional comfort and warmth. Our Slumber Pet™ Double-Sided Sherpa Mat provides exceptional comfort and warmth. This versatile bedding can be used in cages or crates, in cars, or to cover furniture. Can also be used as an extra bed. Resists stains, chewing, and is machine washable for easy care. X-Small measures 17¾"L x 11¾"W, fits crates 18" x 12"
Small measures 23¾"L x 16¾"W, fits crates 24" x 17"
Medium measures 29¾"L x 18¾"W, fits crates 30" x 19"
Medium/Large measures 35¾"L x 22¾"W, fits crates 36" x 23"
Large measures 41¾"L x 27¾"W, fits crates 42" x 28"
X-Large measures 47¾"L x 29¾"W, fits crates 48" x 30"
Slumber Pet Double-Sided Sherpa Pet Mat - Natural Customer Photos - Send us your photo! Sasha-B enjoying her new Slumber pet double sided sherpa mat. Sasha-B really loves it and so do I. Very nice and warm for her. Esasy clean too!! Posted On 07/31/15 by Yasmin from Dallas, TX Yes, Yasmin recommends this product! I really like the crate mat. It is very soft. My one complaint is that I can not keep it from bunching up. Posted On 07/13/15 by Sandy E S from Upstate, NY Yes, Sandy E S recommends this product! Posted On 04/16/15 by sue ellen bozzi from Brooklyn, NY Yes, sue ellen bozzi recommends this product! Absolutely perfect for my pet kennel! Posted On 11/17/14 by Cindy C from Rosamond, CA Yes, Cindy C recommends this product! 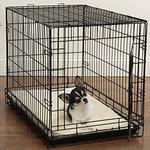 Purchased this for my new puppy kennel. Fit perfectly and is soft & warm. Love all the variety of harnesses and leashes the only online store I'll ever buy from!